Come see the story, new rules and Warscrolls for AoS in the conclusion to the Realmgate Wars series! 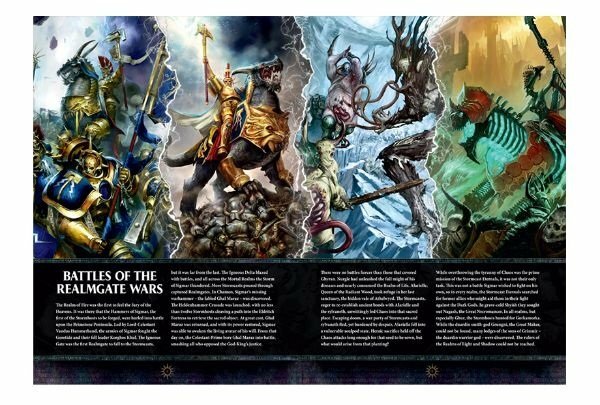 The exciting conclusion to the Realmgate Wars is finally here, and with it tons of new narrative and competitve rules for your games of Age of Sigmar. Today we have a guest review of the story inside the book, but don’t forget to scroll to the bottom and hit play on our first look video reivew of this venerable tome as well! 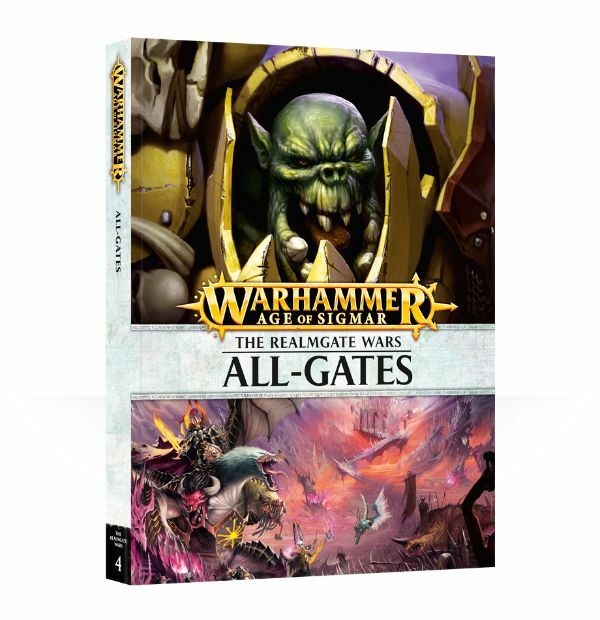 This book concludes the Realmgate Wars story arc that began a little over a year ago when Age of Sigmar released. It is probably the best of the four supplements that tells the story of the Realmgate Wars, in terms of content, presentation, and story-telling. 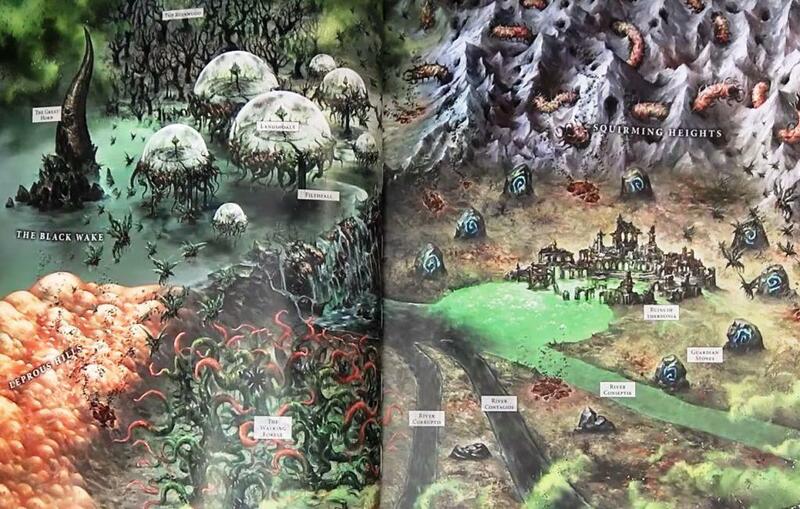 The Realmgate Wars themselves served a really important role in setting the scene for the Age of Sigmar minis game and gave hobbyists a chance to see what sort of fantasy setting is now in place for this game. This book focused on the climactic battles which would determine who won and lost the Realmgate Wars. It picks up right where “Godbeasts”ended. Archaon managed to bind one of the massive Godbeasts, Ignax the Solar Drake, to his will. He intends to use Ignax to smash aside the gates leading to Azyr and finally plunge Sigmar’s realm into Chaos. Little does Archaon know, Ignax was bound by a very special rune through the heroic sacrifice of some Fyreslayers in the previous supplement. Sigmar realizes that the Mortal Realms can only truly be freed once the endless tide of Chaos forces is stemmed. Each realm has what is called an All-Gate. Each massive All-Gate leads to the All-Points, which serves as a nexus to all of the 8 realms. Archaon had set up his main fortress at the All-Points, allowing him to strike at will anywhere within the realms. It has also given him the ability to stream his forces anywhere he needs to at a moment’s command. 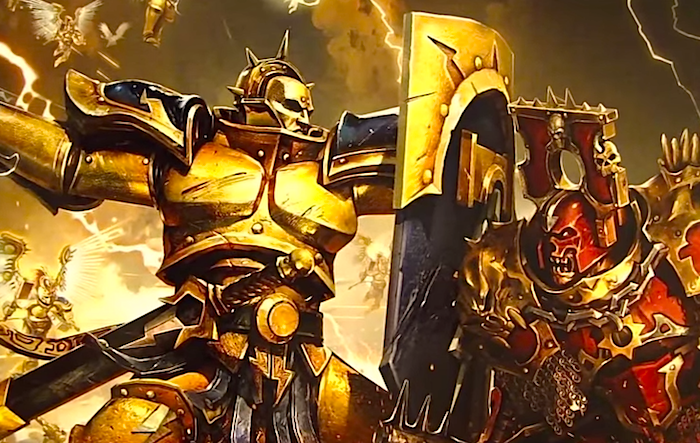 Sigmar launches simultaneous assaults on all of the 7 Chaos-held realms while also enlisting the aid of his once great Pantheon. Needless to say, Nagash stays true to form and lets the Stormcast Eternals die while assaulting the All-Gate in the Realm of Death and learns of the Chaos defenses through the deaths of his would-be allies. The Realms of Light and Shadow are a mystery to Sigmar and he is unable to tell what happens there. There is some very heavy foreshadowing in this book about those two realms and I cannot wait to see where they go with Malerion aka Malekith. The story concentrates on the Realms of Life, Metal, Beasts, and Fire. The War of Life goes exceedingly well when Alarielle awakens and basically tears through the Nurgle defences. She shuts down their All-Gate and the Realm of Life is in a great spot by the end of the War. The battle for the All-Gate in the Realm of Metal is going great until Archaon shows up and perma-kills Thostos Bladestorm, Lord-Celestant of the Celestial Vindicators. 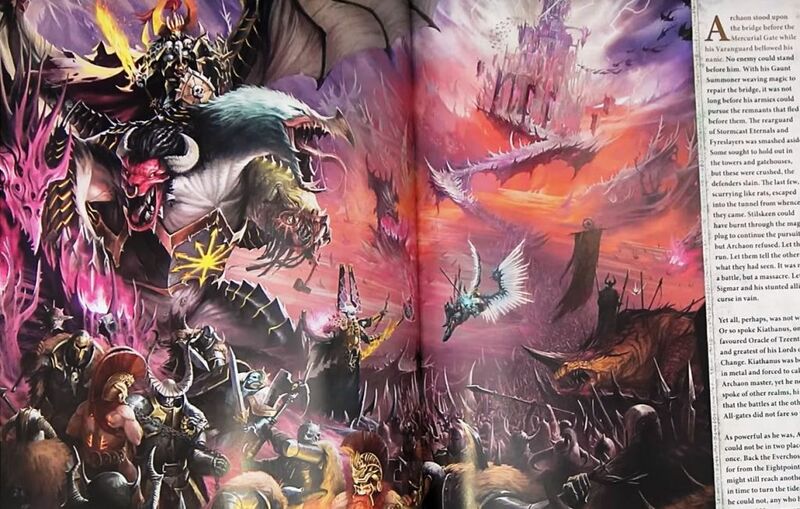 The Realm of Metal is firmly in Archaon’s control by the end of the fight. 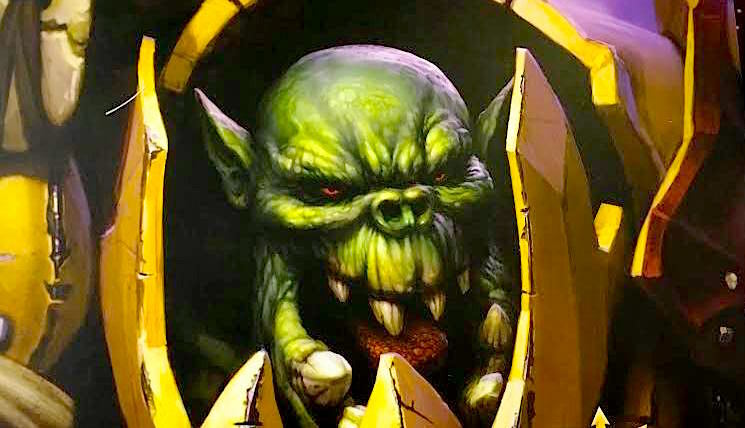 The battle for the Maw-Gate in the Realm of Beasts goes awry when Gordrakk, the First of Gork, shows up and smashes both the Stormcast and Chaos sides. The gate itself disappears without anyone gaining control. The book concludes in the Realm of Fire with a major story turn. Vandus Hammerhand beats Skarbrand himself in single combat and wins the day for the Hammer of Sigmar. It gives a hint of this ahead of time by implying that Sigmar did something special to Vandus during his reforging after his death at the hands of Archaon at Mount Kronus. At the conclusion of the Realmgate Wars it becomes apparent that the forces of Chaos are not longer completely dominant. Life and Fire are both looking to become beachheads for the ongoing war against Chaos. Beasts is completely uncontrolled and Gordrakk’s massive horde is becoming something that Archaon needs to start worrying about. Shadow and Light are both seemingly on their own as well. Death is in chaos-control but with the steady rising of Nagash’s forces it is looking increasibly unstable for Chaos. It is really only in the Realm of Metal where Chaos is completely dominant. At the very end of the story there is a teaser about the rise of Tzeentch and the Silver Tower. I don’t know what these means for future expansions or the story behind Warhammer Quest: Silver Tower. Overall the story was excellent and well-told. This book comes with a massive 11 Battle Plans, 4 Time of War Sections and 11 Warscroll Battalions. There is a load of content and it is of very high quality. The art in here is excellent and does a great job to help the reader visualize what is happening between the pages. It has a very comic-book feel to it and I really enjoyed it. If you enjoy reading about the story behind the games you play, this is a must-have. It gives a lot of depth to the battles being fought and can really help inspire a force you either want to start collecting or perhaps one you want to build upon. I really enjoyed reading it and I am looking forward to using some of the Time of War sections as well as Battle Plans in my local gaming club. – 22 Warscrolls and 11 Warscroll Battalions for Stormcast Eternals, Fyreslayers, Ironjawz, Slaves to Darkness, Daemons of Nurgle and Clans Pestilens armies.